Some of the finest cookware available is made from glass, stainless steel, cast-iron, earthenware and ceramic. Ceramic (pottery) cookware is typically made from clay, but it may also refer to metal bodies coated with a ceramic glaze. 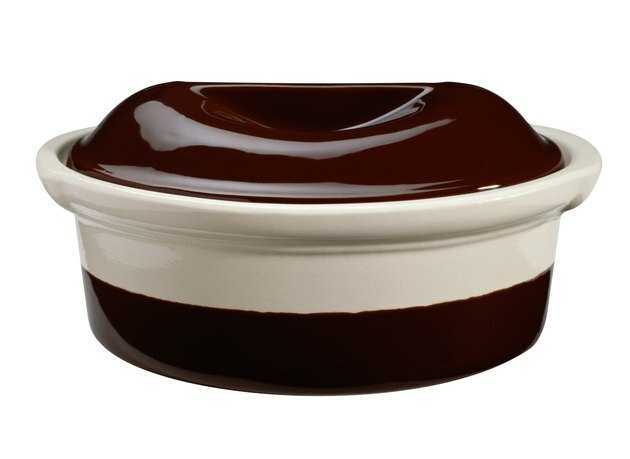 Ceramic cookware is ideal for both cooking and serving food. According to the authors of the book "Gluten-Free Recipes for the Conscious Cook," ceramic cookware slowly conducts heat and can keep food evenly warm for hours. However, ceramic cookware has some dangers that must be considered before use. Ceramic cookware is made from clay. Lead is a naturally occurring element that can easily contaminate water and food owing to its abundance in the atmosphere. Its ingestion can cause damage to the kidneys and nervous system and it is especially dangerous for babies and small children. Ceramic cookware is liable to contain lead that may leak into and contaminate food. The Food and Drug Administration (FDA) and the National Institutes of Health (NIH) state that certain food substances, such as vinegar, tomatoes and oranges, may react with the surface of ceramic cookware and cause lead to be leached. Lead will also leach into hot beverages such as soups, tea and coffee. It is imperative that ceramic cookware only be purchased from large manufactures and the label clearly states the product to be "lead free." Coated and glazed ceramic cookware may contain perfluorooctanoic acid (PFOA), polytetrafluoroethylene (PTFE) and cadmium — all toxic chemicals. These substances are liable to react with food and cause food poisoning. Perfluorooctanoic acid causes reproductive ailments and liver damage when ingested in large quantities and polytetrafluoroethylene can cause respiratory problems. According to the Occupational Safety and Health Administration (OSHA), long-term exposure to cadmium has numerous adverse health effects, including prostate cancer, lung cancer and kidney dysfunction. While ceramic cookware is able to withstand high temperatures, burns can still occur if adequate safety precautions are not taken. Gloves must always be worn when handling hot ceramic cookware to minimize the risk of burns. Ceramic cookware can break under thermal and physical stress. It is important that all ceramic cookware be thoroughly examined for cracks before use. Cracked or chipped ceramic cookware may fall apart during cooking. Even the smallest of cracks may cause small, undetected pieces to chip into the food item, posing a significant risk. Is Melamine Safe for the Microwave? What Are the Dangers of Copper Cookware?